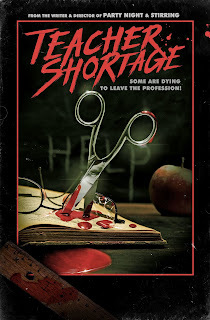 Fright Meter Awards Blog: Fright Meter Films Announces Their Third Feature Film! Fright Meter Films Announces Their Third Feature Film! As Fright Meter Films second feature, the Christmas themed slasher film Strirring begins its festival run, already screening at Texas Frightmare Weekend, Shock Stock, Crimson Screen Horror Film Festival (where director Troy Escamilla won the Best Director-Feature Film trophy), and International Horror Hotel, Escamilla is excited to announce his next feature film, Teacher Shortage. Plot Synopsis: What is supposed to be an educational and collaborative weekend professional development session for the English Department of Prescott High School instead turns into a blood soaked nightmare when a masked killer targets them. Casting for the film will begin soon, and Escamilla hopes to launch a crowdfunding campaign for the film this fall and get the cameras rolling in early 2019.